It’s high noon. The sun is a sweltering ball of dull heat, and the desert is shimmering around you. You can feel the anxious eyes of the townspeople following you, and that brass star on your chest feels heavier than sack of lead. They say those cattle rustlers are mighty quick and going up against two men at once is suicide, but you have a job to do. Itchy fingers can get a man killed, but you’re just waiting for the word. Two shots. Two dead men. This is how the West was won. At least, that’s the picture Bite the Bullet would like to paint. 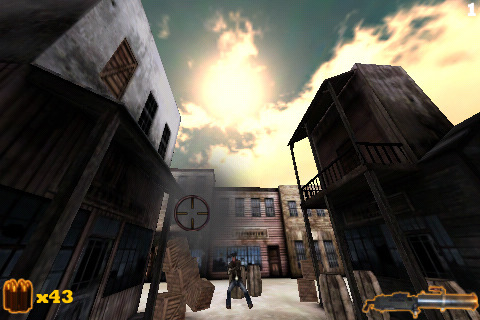 A classic Western shooter in the style of classic cowboy films, Bite the Bullet is a fairly dark and gritty title that is in need of a bit of polish. There is no real story, just you, your guns, and a mess of bandits in need of killing. When you see “Fire”, you must aim with your finger and release to shoot before they get you first. Aiming is actually rather tricky, since the game comes with no initial instructions, which was probably their biggest mistake. Most games have you tapping targets to shoot, but Bite the Bullet requires you to actually line up the shot using the sight. This actually makes the game feel rather frustrating, since it goes against normal touch screen instinct. You get extra points for head shots, and the number and placement of the baddies gets more difficult as you progress through the levels. You also have a limited number of bullets, so accuracy matters. At the start of the game, you can choose classic mode, which as you using tried and true revolvers, or wild mode, which lets you choose from a variety of weapons, some of which depend on burst fire instead of a single shot to mow down your enemies. The graphics and sound are mostly lackluster, and game itself gets repetitive very quickly, and there aren’t many incentives built in to keep you going. The game is free to download, although extra weapons are available as an in-game purchase. There really isn’t a lot to do in the game. There is an online leaderboard, but it’s rather cluttered and confusing. A few unlockable items and a multiplayer option would go a very long way to keeping the game interesting, but it’s rather dull as is. For a free game, Bite the Bullet isn’t all that bad, but without better documentation in place, this game will probably never catch on. AppSafari review of Bite the Bullet was written by Tracy Yonemoto on May 13th, 2010 and categorized under Action, App Store, Free, Games. Page viewed 3846 times, 1 so far today. Need help on using these apps? Please read the Help Page.